We are strong advocates for causes supporting positive animal welfare and improvement for the everday lives of animals. 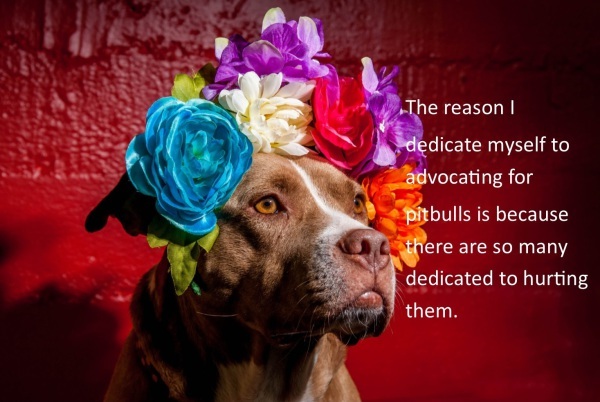 We are particularly dedicated to supporting pitbull type dogs and senior dogs and advocating against the cruelty they face at the hands of humans. Advocacy comes in many forms and Lexy supports those who positively contribute wherever and however they can to make a difference in the lives of animals. Not everyone can rescue animals directly but we each have the capactiy to make a real difference in many ways. We encourage you to learn more and be part of the answer for an animal in need. Here are just a few of the causes close to our heart. Fights typically last 1 to 2 hours or until one dog is unable to go on or dies. The dogs often die of blood loss, shock, dehydration, exhaustion, or infection hours or sometimes days after the fight. Further torture and cruelty are often inflicted on the 'losers' of these fights until they too lose their life. Other animals are often sacrificed as well. Some owners train their dogs for fights using smaller animals such as cats, rabbits, or small dogs. These 'bait' animals are often stolen pets or animals obtained through 'free to good home' advertisements. Dog fighting is a premeditated act of cruelty that must be punished at the highest level of the law. Some people believe that specific breeds of dogs - such as pitbull type dogs - are genetically predisposed to be aggressive and are a public safety concern. This belief is translated into laws referred to as "Breed Specific Legislation", or BSL. These laws make sweeping inferences on entire categories of dogs - not individual dogs - simply based on aesthetics, and are in effect a discrimination that should not be tolderated by any community. BSL is incredibly damaging to all dogs as the laws are vague enough to extend to almost any breed. They irrevocably damage the ability for these dogs to find good homes, be treated with respect, and often even their ability to simply live. They also negatively impact the lives of the humans who call them family. "How much is that puppy in the window?" The cost is incredibly high on the animals who spend their entire lives in squalid conditions, existing only to experience loneliness and pain while earning their jailers a handsome living. There is no greater cruelty for these poor dogs than being forced to breed and denied any happiness or peace. The cost is doubled when we consider the puppies; these poor innocent pups eventually contribute to the overcrowding proplem in shelters. Puppy store pups are abandoned for the same reason any other dog is abandoned to a shelter... they grew up, divorce, no time to look after them, they got too big, too old.. and the list of 'reasons' go on. With over 2 million animals euthanized in shelters every year there is absolutely NO reason to breed dogs. And even more there is never any reason to inflict cruelty on a living thing.